The monumental collapse of the ABC Learning empire — much like the economy that incubated its malignant growth — should not be seen as a total calamity, despite the obvious potential for fallout. Regardless of the Federal Government’s bailout package, the debacle is only beginning to reverberate through our community. The revelation that almost 400 ABC Learning centres may close clearly brings dire consequences for staff, parents and 30,000 children at ABC. Not to mention shareholders. Receivers McGrathNicol have looked at the figures and decided that more than one in three of ABC's profligate centres aren't sustainable, despite the essential nature of childcare in today's economy. The effect this will have is palpable. The first news of ABC's woes brought a rush on community-based childcare, while this latest announcement's timing is drawing an impassioned response from parents and the media. Beyond further government lifelines or a rival's takeover of these centres, what hope is there for families and workers in places as disparate as Central Sydney and Innisfail? ABC staff and parents, as much as governments and administrators, would do well to look at a phenomenon that emerged in the wake of the Argentine economic collapse in 2001. After the dust settled on el saqueo — the collective term for the devaluation of the Argentine peso, the run on the banks and the rioting, looting and death that followed — workers' collectives organised to run their enterprises autonomously. The bosses had jumped ship. They left their workers unemployed and, in most cases, with workplaces where the assets had been stripped, sold or even smashed. But intrepid Argentines began the arduous task of getting their jobs back by recuperating the spaces left fallow by their absentee owners. The illusion that executives and industrialists held some ethereal knowledge of business beyond the average workers' grasp quickly evaporated. Self-interest meant the workers ran the business better than the bosses who, much like ABC's Groves, had been reluctant to shoulder responsibility at the time of the crisis. Perversely, as the cooperatives proved viable and the economy turned around, these same employers came out of the woodwork and began their fight to reclaim the businesses themselves. They had varying degrees of success thanks to the Argentine government's de facto endorsement of the takeovers, in the form of the Ley Nacional de Expropiación or National Law of Expropriation. There is a considerable difference between post-crisis Argentina and still-wealthy suburban Australia teetering on the edge of recession. Militant unionism, factory occupations and violent protests aren't particularly common in Australia, just as a 'she'll be right, mate' attitude doesn't come easy when one's life savings have been halved by order of the central government. However, the overnight disappearance of 30,000 childcare places does have serious implications for an economy already under duress. Surely some creative thinking is required. With the Rudd government staring down the barrel of a budget deficit, calls for a nationalisation of ABC seem unlikely to resonate with a cash-strapped treasury. Equally, as the private sector is hemorrhaging at an astonishing rate, finding sufficient capital to take over the old ABC centres could also prove difficult. The community model of childcare draws almost universal acclaim from workers, parents, children and early-childhood learning academics. Indeed, the community sector's peak body, Australian Community Childrens' Services, identifies the community model as having been the predominant form of childcare in Australia before the Fraser government's opening of the sector to private investment. Waiting lists for community centres are such that children registered at conception only receive places as toddlers, or later. 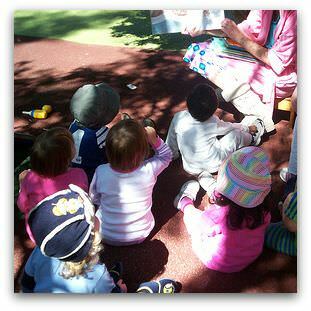 A full-fledged nationalisation would go some way to closing the door on the for-profit model of childcare in Australia. How would smaller private providers compete with a burgeoning community sector and an entirely public, national childcare provider? A cooperative, worker owned-and-run model would allow space for the private sector to coexist with community care, give workers and parents more direct ownership of centres, and effectively outsource the provision of this essential service, freeing up valuable government resources. A community-cooperative model could also allow greater autonomy for individual centres. Given the vastly different needs of communities in urban, rural and remote areas, this is particularly attractive. ABC's demise is as much an indicator of economic structural rot as was the Argentinean meltdown of 2001. Bailouts, and to a lesser extent nationalisations, are band-aid solutions to what will be a persistent problem. The time for creativity and resourcefulness is now. Cameron Durnsford is a freelance writer and host of Radio Democracy on Brisbane Community Radio 4ZzZ (102.1 FM). He has lived, worked and studied in Latin America, where he followed social and environmental justice movements. Great article Cameron! YES, the Argentine experience could serve as great inspiration for us all. Unfortunately good times tend to make us all complacent and "dependent" on government to solve economic ills, when in reality we, the extraordinary, ordinary people are the only ones that have the power to change things. Community based childcare is a fabulous model for all of the reasons you listed and more but does the community still have the collective will to work together to "serve" their community. I hope so. The brightest lights of the punditry constellation visible through Australia's media telescope are forever pointing out that the engine of growth is competition. (Leaving aside the question of whether endless growth is a prudent goal on a finite planet), I note that all organisations that have more than one member are necessarily driven by co-operation, whether that co-operation is hierarchically obtained by coercion, or obtained among equals by consensus. That is, the competition so beloved of the above-named Theorists is competition between co-operatives. In Argentina, necessity has driven the emergence of the latter. Perhaps it would be wise to encourage the emergence of co-operatives before economic collapse necessitates the same. I'm all for community or local government run child care primarily because of the better quality and standard of care hat is offered. But community or local government management doesn't make the viability problem disappear. The prime factors determining viability is government regulation and size. Because of mandated staff/child ratios, small centres have no hope being viable in the normal sense of that word. Only big centres with high occupancy rates and minimal debt will ever be 'viable' and then only because of the miserable rates that we pay child care staff. Community based care is a great start but it's not a magic bullet. The outcomes of the G20 meeting this month demonstrate the limited vision of many of the world's politicians in confronting the global financial crisis. If our leaders can't imagine a different future, it is up to us to do so.